Ambient Weather professional weather station allows you to monitor your home and backyard weather conditions with the brilliant, easy-to-read LCD color display. 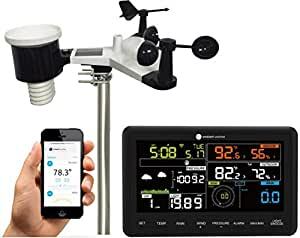 The enhanced Wi-Fi connectable option that enables your station to transmit its data wirelessly to the world’s largest personal weather station network, weather underground. Experience the convenience of having your personal weather information with you on the go using your computer, tablet, or mobile device. In addition to underground, the weather station supports uploads to weather bug and weather cloud. The weather station measures wind speed, wind direction, rainfall, outdoor temperature and humidity, solar Radiation and UV. Also included inside the console is temperature, humidity and barometric pressure. The weather station also calculates dew point, wind Chill and heat index. The Osprey streams weather data real time (approximately 16 second updates) to the weather underground website, the best website for collecting and storing real-time personal weather station data. Send real time data to weather bug website. Weather bug backyard tracking Stations empower weather enthusiasts to get their name on the map and have their tracking Stations’ data seen by millions of users via the weather bug application. Send real time data to weather cloud website. Weather cloud makes managing your device not only easy, but fun. Access the app from your computer, tablet or smartphone and enjoy the same user experience across all devices.